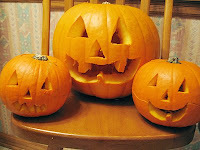 Tonight we carved our pumpkins that we recently bought from the local pumpkin patch. Our son wanted a smiley face and our daughter wanted a scary face. "It's Halloween, so it HAS to be scary! ", she insisted. Our son dropped his pumpkin on the kitchen floor (on R.), which created a crack, so we decided his had a "mustache". - Put the seeds in a colander, and rinse well. Squeeze the pulp in your hands to loosen the seeds. - Put the seeds on a baking sheet to try overnight. 24 hours of drying time is best. Remove the remaining pulp the next day, when dry. - Preheat oven 250 degrees. Line baking sheet with foil. - Coat your dried seeds with melted butter or olive oil. Or maybe a little of *both*. - Sprinkle with salt. Toss every 15- 20 minutes. Bake for 1 hour until golden brown. Does anybody have any good uses for the pumpkin pulp? I threw it away, but couldn't help but wonder what else it could be used for. Perhaps "waste not" opportunity was missed...Has anybody tried making a pie or bread with fresh pumpkin? We are really getting into the Halloween spirit this year! It's me--your husband! 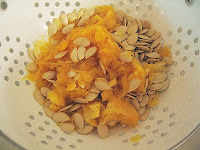 Love the blog entry about baking pumpkin seeds! Especially like the part about the dropped pumpkin having a mustache. Perhaps the pumpkin pulp could be used to feed birds or squirrels outside. Keep up the good work! There's not a ton of pulp that comes out with the seeds. You could just throw it in the blender if you're making a smoothie. It wouldn't have a strong flavor so you could get away with it. I've made pies and bread with fresh pumpkin. The flavor is so good! Just bake the pumpkins in the oven and when they're soft, scoop them out. You can make pancakes, muffins, and cake, too! Just be sure to puree the pumpkin in a blender so you don't have any chunks. Have you ever seen the cookbook Simply in Season? It has a lot of good ideas for recipes that use seasonal fruit and vegetables. Thanks for the tip, Sarah. The larger pumpkin had much more pulp than the smaller ones, and the smaller ones had many more seeds. Not sure if that is usual or unique to these particular pumpkins. Thanks for the tips, I will save the pulp next year! And I'll look up Simply in Season, sounds great!